Whoever coined the word "doorbuster" should be sitting on a beach in Cabo right now, reaping the rewards every time a retailer uses it. JC Penney is offering big doorbuster deals today, starting at just $6. Find clothing for the family, towels, jewelry, even Angry Bird shirts. When did that become a fashion brand? My nephew has a pillow with the little guy on it. Anyway, there are discounts up to 40% OFF. 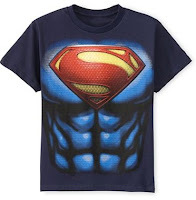 Since I'm going to see Man of Steel today, I'm thinking I'll represent with the shirt you see displayed to the right. It's only $6 (reg. $9). Click here to view the deals at JC Penney.